St. Michael Catholic Church, 3705 Stone Lakes Drive, Louisville, KY.
James Carl Wilson, age 88, of Middletown, KY passed away on Monday, February 11, 2019, at Hosparus Health of Louisville. He was a US Navy veteran who served in the Korean War. He was also a retired Louisville firefighter and finished his professional career as a courier supervisor at Clinical Pathology Associates. He was a Kentucky Colonel and a devoted member of St. Michael Catholic Church. Jim was proceeded in death by his two sons, Daniel L Wilson and Mark J. Wilson. In addition, he was also preceded in death by siblings Frances D. Brewer and Paul A. Wilson. 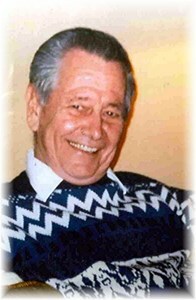 Left to cherish his memory is his loving wife of 63 years, Shirley A. Wilson; daughters, Cheri A. Gustafson (Arlen), Kathleen A. Bowles, Ann Jerde Wilson (Mark); and sons, James C. Wilson Jr (Angela), and Barry A. King (Daniel). Jim has nine grandchildren, Wesley, Beige, Austin, Clint, Zachariah, Mark, Savannah, Nina, Sofia, and one great-grandchild, Tucker. He is also blessed with many loving friends and extended family. Visitation will be 3 to 8 pm on Thursday, February 14, 2019 at Newcomer Cremations, Funerals and Receptions, East Louisville Chapel, 235 Juneau Drive in Middletown. Mass of Celebration will be 11 am, Friday, February 15, 2019 at St. Michael Catholic Church, 3705 Stone Lakes Drive, Louisville, KY. Burial will follow after the mass in Calvary Cemetery. In lieu of flowers, donations may be made to St. Jude’s Children’s Hospital or Hosparus of Louisville. To leave a message for the family, please use the "Share Memories" button. Add your memories to the guest book of James Wilson. I remember your Dad growing up next door to you guys from 1973 to 1979. While a man of few words, I remember one time, we screwed something up on a sofa bed and I asked if he could come lend a hand and without hesitation, he dropped what he was doing and walked over to help. And in about 10 minutes, he helped me fix it. All of you have a very special place in my heart and the world is not quite as good a place without your Dad here. I remember that Jim built an amazing play house in the backyard. It was big enough to have several kids inside at one time. I was jealous that the Wilson's had such a talented Dad to build it. We are so sorry to hear of the passing of Uncle Jim. We send our love and prayers to Aunt Shirley and the rest of the family. May God bless and keep you all.